The Cutty Sark was one of the most famous sailing ships ever to sail the seven seas. And following her departure from Cardiff on the 7th June 1880 she would become part of one of the most famous stories of the sea that was told and re-told in ship’s fo’c’sles and taverns all around the world. Captain John Wallace had been to Cardiff many times before, as master of the County of Peebles, and now in command of the Cutty Sark. Wallace was regarded as a fine seaman and a good captain but his counter balance was the ship's mate, Sydney Smith, an uncompromising man and inclined to give seamen a hard time. When the ship put into port she was short of crew and two extra hands were signed on in Cardiff. Finished now with her famous tea clipper days, the Cutty Sark was more often now carrying wool from Australia. But she had been sent to Cardiff to restock the US Navy’s Pacific bunkers with best Welsh steaming coal. One of the crew taken on at Cardiff was a black seaman named John Francis. As soon as the voyage began, Francis was at odds with Cutty Sark’s mate. It seems that the hard and unsympathetic Sydney Smith was something of a bully as well. Things went from bad to worse as the passage wore on and the two men had a fight following an exchange of threats. Then, in the Indian Ocean, a storm sprang up and at the height of the gale Francis twice ignored orders given out by the Mate. Smith flew at Francis when he brandished an iron bar at the mate. The mate seized the iron bar from the seaman and turned it on him striking him across the head. Francis fell to the deck unconscious and he died of his wounds a few days later. Francis was not a very popular man even with his own crewmates but they were incensed with Smith for having killed him and swore to see him tried for murder. Captain Wallace had no choice but to put the mate under arrest and he was confined to his cabin. But when the ship arrived at Anjer for orders, Smith talked the captain into letting him quietly escape over the side. After the ship had sailed for Yokohama and the crew found out what had happened they went on strike and it was left to the officers and apprentices to continue to sail the ship. Three days into the passage to Yokohama, on the 5th September, the ship became becalmed in the Java Sea. Captain Wallace grew moody; the strain of the strike by the crew and the guilt over his conspiracy with Smith was weighing heavily on his mind. He realised that his career as a ship’s master was probably finished. And the heat and lack of wind as the ship lay becalmed in a flat sea only added to his dejection. Early on the morning of the fourth day, Wallace emerged from his cabin, spoke quietly to the helmsman and then silently stepped over the taff rail at the stern of the ship. The crew quickly lowered a boat but although the sea was totally calm, no sign of the captain could be found. He had sunk like a stone and was missing presumed drowned. The ship was left in command of the second mate who almost wrecked her as the vessel made her way slowly back to Anjer where a replacement master and mate were found. It was not one of the Cutty Sark’s most memorable of voyages. Sydney Smith was eventually arrested and went on trial at the Central Criminal Court in London for the murder of John Francis. But the jury took account of the circumstances of the incident and they convicted him on a charge of manslaughter. He was sentenced to seven years imprisonment and spent much of his time in hard labour, working on the breakwater at Dover. After completing his term he returned to the sea where he made his way up to becoming a master himself with the Anglo-American Oil Company. Still a hard man but perhaps mollified by his experience aboard the Cutty Sark and her 1880 passage out of Cardiff, he died in 1922 at the age of seventy-two. In a return to happier times, the Cutty Sark was involved in an incident that was remembered for much better reasons. One clear night in July 1889, Robert Olivey, Second Officer aboard the ss Britannia, one of P & O's finest steam ships, stood in awe as he watched the lights of a sailing ship overhauling Britannia that at the time was steaming at some fifteen knots. He called the ship’s master, Captain Hector, on deck to witness the astonishing sight and a note was made in the ship’s log. At the time, the officers were not aware that the ship that passed them, at seventeen knots under sail alone, was the Cutty Sark, under the command of Captain Richard Woodget, a fine seaman and probably the most successful master to command the ship. 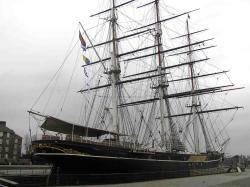 This famous old ship has survived to this day, landlocked and preserved in London, though it was touch and go following the fire that engulfed her in 2007.